With its beautiful beaches and relaxed atmosphere Byron Bay is a popular travel spot. The beachside town is filled with so many exciting activities for the whole family to enjoy, especially the kids. 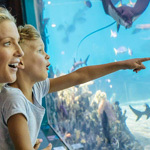 We break down what we feel are some of the best – and best value – attractions in Byron Bay and surrounding areas that the little ones will love! Byron Bay's lovely beach is enjoyable enough in and of itself - but add a dose of four-legged and family-friendly enjoyment to the proceedings, and you've got one of the best ways for those with kids to enjoy Byron. Local operator Pegasus Park Equestrian Centre offer a range of quality horse riding experiences, including beach rides that last for 1.5 hours and cater to riders of all ability levels. This is the perfect way for you and your children to enjoy the sun, surf and scenery of Byron Bay as your expert guide takes you along 7 Mile Beach on horseback. "Experience a different side of Byron Bay by riding horseback along the beach with an expert guide." You’ll be taken along the secluded beach and if you’re lucky you might spot some dolphins playing in the waters not far from the shore. We as humans aren’t the only ones who love the water - the friendly horses also love to go into the Byron Bay surf. Remember to pack your board shorts because selected tours will let you catch some lapping waves with your horse! Perfect for first time riders and children, the whole family will love experiencing Byron Bay by horseback. The Summerland House Farm in Northern New South Wales is a farm with a difference on the Alstonville plateau, just 35 minutes drive from Byron Bay. With a touching history and a desire to be an equal employment opportunity provider, Summerland House is run on 172 acres and is open to the public 7 days a week. The property boasts an avocado farm, macadamia farm, a packing shed, a waterpark, mini golf, hundreds of chickens, a grocer, nursery and gift shop plus fun tractor led tours. If you want to give the children an insight into a real life working farm then Summerland House is a great place to start. Summerland House runs tractor led tours through the macadamia and avocado orchards sharing the insider secrets to agricultural practices. "If you want to give the children an insight into a real life working farm then Summerland House is a great place to start. Summerland House runs tractor led tours through the macadamia and avocado orchards sharing the insider secrets to agricultural practices." The tours give small children an introduction to farm life and an understanding about the origins of food and the work that goes into bringing your avocado toast to the table. The tractor led tours cost $5 per person and last for about 30 minutes touring through the Summerland House Farm. The second most popular activity among the children, particularly in the summer time, is the free waterpark consisting of a splash zone, small playground and grassed picnic areas. After exploring the farms and the extensive on site nursery there is always the 9 hole mini golf course. The farm themed golf course is a great activity for all ages and is just $5 per person. And if you are feeling hungry, visitors can either pack a lunch and make the most of the grassed picnic areas near the waterpark or head to the Summerland House Farm Restaurant. A visit to Summerland House Farm is a fun and educational day out for the whole family mixing child friendly activities with education about food and the environment and is open from 9am to 4pm daily. Get wet, exercise, AND have fun as you paddle over the waves and float over the beautiful blue waters of Byron Bay on a trip with operator Cape Byron Kayaks. The 3.5 hour tour will take you out into the ocean to paddle among playful dolphins and if the timing is right you can get up close to the migrating Humpback whales. Your experienced guide will take you around the area sharing local aboriginal stories and histories about Byron. Paddling out is a little challenging but it’s worth it when you get to surf the waves back in. You can paddle along Cape Byron, Wategos or The Pass and see the lighthouse from your kayak. "The 3.5 hour will take you out into the ocean to paddle among playful dolphins and if the season is right you can get up close to the migrating Humpback whales." This is the perfect activity for those adventurous kids who love a challenge and love being rewarded for it. As well as kayaking, you can also snorkel! All safety and snorkel equipment is included in the price, giving you and your family two exciting activities to try. It doesn’t matter if you’ve never sea kayaked before, novices are more than welcome and your guide will be there to help you the whole time. Tours run all year round twice a day at 9:30am and 2pm. Ever dreamed about running away to join the circus? Well Circus Arts can help you turn that dream into a reality, helping to perfect your skills to become a great circus performer. There are so many great activities the kids will love, while also picking up some new abilities as well. Circus Arts have everything you need to get that real circus experience, they can learn to fly on the 10 metre high trapeze, climb the indoor wall, learn to juggle or master the hula hoop. "Circus Acts have everything you need to get that real circus experience, they can learn to fly on the 10 metre high trapeze, climb the indoor wall, learn to juggle or master the hula hoop." There are a range of classes to choose from for all ages and a play space for the young ones up to 10 years old. In the space they can run around and play with the range of toys, books, puzzles, blocks and cars or jump around on the jumping castle. Big Top Cafe is also open for parents to relax while the kids run themselves silly with all of the activities on offer. Circus Arts is a great option for kids who have excess energy and enjoy being active and social- and with the entire premises indoors it can make a great rainy day option too. Byron's waters aren't just pretty to look at - they're also teeming with marine life that makes them a joy to explore. Water-loving families can swim with sea turtles, manta rays and a range of tropical fish species at the Julian Rocks Marine Reserve just off the coast of Byron Bay with snorkelling courtesy of Byron Bay Dive Centre. "While in the water you’ll also get the chance to brush fins with some friendly Wobbegong sharks and hundreds of different fish species." 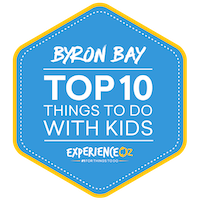 This is a great way for the kids to get up close with some Australian marine life that have made the Byron Bay waters home. While in the water you’ll also get the chance to brush fins with some friendly Wobbegong sharks and hundreds of different fish species. Tours run for approximately an hour and leave three times a day, from 8am, 11am and 2pm. The snorkel site is about a 5 minute boat ride from the mainland. All snorkel equipment is included in the price, as well as wetsuits and snorkel lessons if required. Who ever thought healthy food could be so much fun? Tropical Fruit World certainly makes it enjoyable - and your kids may just learn something along the way, too. Some of your children are probably grimacing at the thought of a fruit tour, but this is an attraction they won’t want to miss! The park features rare fruits your kids never knew existed, such as the chocolate pudding fruit, chewing gum tree, banana bubblegum fruit and ice-cream bean! I bet that has their attention now! Join the Plantation Safari around the grounds to taste, touch and smell some of these amazing fruits that sound too good to be true. The park features over 500 different varieties of exotic fruit from around the world. "The park features rare fruits your kids never knew existed, such as the chocolate pudding fruit, chewing gum tree, banana bubblegum fruit and ice-cream bean!" This is an exciting, interactive adventure the whole family will love. There are so many activities and sights to see at Tropical Fruit World including Treasure Island, the Mini Rail Road, Jungle River Cruise and Fauna Park. The park is open daily from 10am to 4pm. Hotel transfers aren’t included in the admission but can be added on for an additional fee. The Farm in Bryon Bay has become one of the most popular attractions in the community. Not only is it a contributor to the local food chain but it attract visitors from far and wide to educate city folk about working farms, has a delightful on site gourmet restaurant and runs the ‘Farm Kids’ educational program and school holiday workshops. With the aim to educate and inspire, The Farm invites visitors to come along and see first hand how their food is grown, a farm is operated and give an understanding of food can contribute to a healthier lifestyle. The Farm operates over 80 acres of land using sustainable and ethical farming techniques that are 100 percent chemical free. And among some of the animals of the farm are heritage-breed pigs, cattle and chickens which roam freely on the grounds and whose meat and eggs are used within the Three Blue Ducks Restaurant and Produce Store. If you have children with curious minds or perhaps they are fussy eaters then a visit to The Farm Kids is a great way to teach them about where and how food is produced. The Farm offer a Mini Farmers holiday program which puts their learning into action by getting the kids to work alongside farmers to help with some basic chores. "With the aim to educate and inspire, The Farm invites visitors to come along and see first hand how their food is grown, a farm is operated and give an understanding of food can contribute to a healthier lifestyle." The children will get to collect and clean the eggs, feed animals and help to check the fences and clear the paddocks. The chores are also followed by a cooking lesson where they can create food and learn valuable personal skills like teamwork and the spirit of community. In addition to the Mini Farmer program are half day school holiday workshops that focus on a variety of different topics including the animals on the farm plus issues like organic farming, pollination, composting and paddock rotation. Outside of school holidays, if you simply want to visit the farm then you can come along and join a guided farm tour on Fridays, Saturday and Sundays and Mondays at 11.30am where visitors are given a behind the scenes tour of the farm. The one hour tour gives you the chance to personally meet the farmers and learn about ethical farming practices for a very modest fee of $5 per child, $10 per adult or around $25 for a family of 4. The Farm is open 7 days a week to the public from 7am to 4pm with guests welcome to join a self guided tour and handy maps provided for you at any time if you miss a guided tour. There is much more here than meets the eye at the Macadamia Castle. Filled to the brim with activities for the kids, this attraction should not be overlooked. From the animal park, to mini golf, keeper talks, mini train rides, face painting, bird shows, a nocturnal theatre, the frog conservation pod and of course the Macadamia castle itself- there are plenty of activities that make a great day out for the family. The striking Macadamia Castle is free to enter and inside visitors will find retailers selling delicious hot roasted macadamias, fine food products and gifts and souvenirs. Free nut tasting is offered all day which is great for those who are being introduced to the delicacy and there is an onsite café serving up local coffee, scones, homemade cakes and many more delicious goods. The Macadamia Castle is also home to an animal fun park with educational experiences and close encounters with wildlife. Within the animal fun park is a daily programme of interactive animal activities including but not limited to rabbit petting, personal encounters with baby animals, keeper talks with koalas, wombats and more. Not to be missed is the Nocturnal theatre show where you can actually meet and have your photo taken with some of the mysterious creatures of the night in the dark. All kids love train rides and parent love to rest their feet so why not take a short ride on the mini train and listen to commentary from park keepers about some of the residents of the animal park (additional costs apply). And if you need a break from all the exciting animal exhibits and show then there is always the 18 mini golf course that are free to ticket holders of the park. Admission prices start from $15 for children and $25 for adults with the park open daily from 8am to 5pm. The young ones will love running around and exploring the magical space that is Crystal Castle! The beautiful gardens and mystical statues will feel make them feel like they are in a real life enchanted garden. The giant stone Blessing Buddha and the ancient Sacred Labyrinth are always a hit with the kids. The spiritual connection the castle has to the land is one that has to be experienced. Immerse yourself in this spiritual haven and let the day pass by without a care. "The beautiful gardens and mystical statues will feel make them feel like they are in a real life enchanted garden." The Crystal Castle is open daily from 10am to 5pm, a short drive from Byron Bay. Visitors can also browse the exquisite collection of jewellery, crystals, books and treasures on sale. Get active on your Byron Bay holiday and go on a mountain bike adventure through the world heritage listed Nightcap National Park. Weave your way around the ancient volcanic terrain with the help of a passionate, qualified guide. You’ll be led on a range of fire trails, back country single tracks, downhill strips and log jumps, perfect for those thrill seeking young ones. As you ride around Minyon Falls you might even spot a koala lounging in the tree! "You’ll be led on a range of fire trails, back country single tracks, downhill strips and log jumps, perfect for those thrill seeking young ones." The ride paths change daily but they always include a stop for a light snack and finish with a swim at a secret swimming spot at the crest of Minyon Falls. There is a picnic lunch included for you to enjoy around the water as well as a final stop on the way home for homemade organic ice-cream. The ride is suitable for all fitness levels and riders from beginners to advanced. Depending on the path chosen and the fitness levels of the riders, the trail can total between 12 and 25 kilometres return with some steep inclines. The easternmost point of Australia’s mainland has come a long way from its origins as a humble hippy town; while it still retains an alternative vibe and laid-back atmosphere, Byron Bay is a true up-and-coming Aussie travel spot due to its combination of outstanding beaches, wonderful scenic outlooks, lush greenery and family-friendly, uncrowded environment. Boasting a spectacular stretch of coast that has been carefully developed to add facilities without detracting from its beauty, Byron serves as a pleasant, low-key alternative to the busier and more commercialised resort towns and cities located further north. Add in some additional tourist-friendly construction in terms of walkways, modern cafes and restaurants, and a range of arts and crafts stores and it’s apparent that “Balance” is the key to keeping Byron Bay such an enjoyable place for a getaway. Throw in wonderful weather all-year-round and an increasingly robust nightlife scene, and you’ll be spoiled for choice with a visit to Byron. If you’re planning a visit to Byron Bay for the first time and are not quite sure how to best spend your time at this Northern NSW oasis, take a look at our list of the Top 10 Things to do in Byron Bay and surrounds here. In terms of recognisable icons, there are few that scream “Byron Bay” more than its iconic lighthouse perched atop its 94-metre-high clifftop that’s become a symbol of the Easternmost Point of Australia. It’s a historic and picturesque building that harks back to the days of earlier naval navigation before satellite technology and other advances made things that little bit easier, opened back in 1901 and doing its due diligence for 100 years. Coupled with its wonderful surroundings – cliff faces plummeting directly down into frothing ocean below, lovely greenery contrasting with the dark of the rocks, a large array of sea birds both in the air and the outcroppings and, of course, an uninhibited view all the way out to the horizon make for one of the most scenic lookout points on Australia’s east coast. The Byron Bay Lighthouse and its lookouts boast sunrises and sunsets that are famously beautiful, and it’s a spot that’s renowned for the characteristic pink-purple hues in the sky that make for a truly impressive scene. The lighthouse’s extreme easterly location also makes it one of the first places in Australia to receive sunlight every day, so if you’re there for a sunrise viewing, feel free to pat yourself on the back for this feat. It’s also perhaps one of the best land-based whale watching spots on Australia’s east coast, and during the busiest part of the whale season the massive mammals put on quite a show that is easily visible from the clifftop. "The Byron Bay Lighthouse and its lookouts boast sunrises and sunsets that are famously beautiful, and it’s a spot that’s renowned for the characteristic pink-purple hues in the sky that make for a truly impressive scene." Accessing the lighthouse can be done in a couple of ways, the first and easiest of which is to drive. It’s only a fairly short trip out from the centre of Byron Bay by car (roughly a 10 minute drive), and once there you’ll have two options for parking. There’s a dedicated carpark at the top of the main lookout area which costs $7 and puts you basically “into the heart of things” without any strenuous effort – which, given the number of people you can fit into a car and the ability to bring the elderly or those in wheelchairs along for the trip, can be well worth paying. There is also a lower parking area for $4 per hour that requires a bit of a walk, although nothing compared to the other “full” walking options; the road heading up to the lighthouse is quite steep, however, so if you’re not wanting to deal with a bit of effort paying the difference may end up being worth it. Byron Bay wouldn’t be Byron Bay without two things: its alternative hippy influences (gradually disappearing) and its main beach that serves as its key natural showcase. And what a beach it is – sporting a long, relatively uncrowded stretch of coastline that’s highly accessible and yet remains largely untouched by development despite the growing popularity of the town, Byron Bay Beach is one of the best in the country due to a variety of factors, some of which have already been mentioned here. Great surf breaks, well-looked-after sands and shorelines and a number of beachfront esplanades and walking tracks all come together to make for a foreshore area that’s enjoyable for single travellers and families alike. With the golden sands of the beaches sitting alongside some vibrant green national parkland, as well as surrounding cafes and restaurants offering a bite to eat within a short walk, it’s a main beach area of which many other towns and cities in Australia would be jealous. A lot of what makes the beach atmosphere of Byron so pleasant is wise and conservative town planning local council has done a good job of preventing the overdevelopment of the beachfront areas so that it’s not blanketed in highrises as is the case with some other coastal travel hotspots. Located directly in front of the town, it’s somewhat of a miracle that a grab for easy waterfront property development hasn’t been allowed, with its longstanding Surf Club being the only (and necessary) building that inhibits any views somewhat. The beach’s north-facing nature also offers sheltered conditions that make for solid conditions for both surfing and swimming, which along with its abundance of parkland and plenty of facilities also make it one of the most family-friendly things to do in Byron Bay shire. Playgrounds, public toilets and BBQ facilities make it possible to spend a full day here with the little ones, and it’s likely to serve as a frequent returning spot of any travellers spending an extended stay in Byron. "With the golden sands of the beaches sitting alongside some vibrant green national park, as well as surrounding cafes and restaurants offering a bite to eat within a short walk, it’s a main beach area of which many other towns in Australia would be jealous." Byron Main Beach is also very well patrolled – a tip of the cap to its crew of dedicated surf lifesavers (stick to the flags, people!) – with safety a primary concern during the summer months. Those not to keen on the water can enjoy one of the lovely walking tracks that take you along the beach on a pleasant little journey around the headland, with extended walks possible if you’ve got the energy for it. Great views of mountains in the distance along with opportunities for whale and dolphin sightings and a glimpse of the region’s famous lighthouse round out the package. In addition to its main beach, Byron Bay also sports a number of auxiliary beaches amongst its 30-odd-kilometre worth of beach area, each with their own quirks, facilities and characteristics. Clarkes Beach which connects to the main beach is another north-facing offering that’s popular amongst windsurfers and paragliders, and is a known hotspot for humpback whales seeking temporary shelter on their annual migration, while others such as Watego’s (for longboarders), Little Watego’s (for families with kids and fishermen), Tallow Beach (dog-friendly and thus ideal for those with pets) and Belongil Beach (also pet-friendly and site of the SS Wollongbar wreck) each offer something different. imply put, if you’re after a day’s worth of leisurely entertainment in the sunshine surrounded by golden sands, shady park areas and some vibrant, turquoise waters, you’ll be spoiled for choice regardless of which part of Byron Bay’s waterfront you choose to spend your time at. Want to view Byron’s beauty from the air but a skydiving experience a little too extreme for you? Understandable, and fortunately there’s an easy, tranquil and laid-back alternative that awaits – a hot air balloon ride with Byron Bay Ballooning should do the trick. Byron Bay’s spectacular “Green Cauldron” is a stunning and criminally underrated environment that deserves more national press for its scenery, and this is something you’ll get to fully appreciate when seen while floating through the air in the early morning sunlight. An experience that blends scenery and sightseeing with a touch of romance and some of the best photo opportunities you’re likely to come across during your time exploring Byron, a hot air balloon ride might not be cheap but in terms of providing views and a sense of scale of the landscape and layout of this part of Northern NSW as a whole, it’s definitely hard to beat. A locally owned and operated company, the balloon guides here sure know their stuff – not only are they expert pilots but they know the region like the back of their hand, and as a result a ballooning ride here is as informative as it is beautiful. The ballooning experience requires a VERY early wakeup (rise and shine at around 3:30am) – launching pre-sunrise is the goal, and with the combination of getting to the launch site, inflating the balloon and climbing into the basket there’s a lot of pre-flight preparation involved. There’s a reason for this, however: the combination of the stillness and clarity of the morning air coupled with the wonderful spectacle of the sunrise casting its colours of the landscape more than justify the sleepy eyes. Once in the air, the rewards become obvious – you’ll have roughly an hour’s worth of flight time, and there’s an eye-popping array of sights to take in during that time. "Byron Bay’s “Green Cauldron” is a stunning and criminally underrated environment that deserves more press for its scenery, and this is something you’ll get to fully appreciate when seen while floating through the air in the early morning sunlight." This part of the country with its low-lying hinterland valleys produces a panorama of fog-drenched countryside that adds an aura of mystique to the experience, and at this height, the blend of additional views on offer is extensive. The panorama extends from the beaches and coastline of Byron Bay and its surrounds all the way out to the Mount Warning National Park and its iconic peak in the distance, and ocean views make for the possibility of spotting breaching whales during their migratory period. 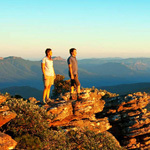 Flying over gorges, patchwork tapestry of fields and paddocks and more is all accompanied by expert commentary on the regional highlights and landmarks, with the staff combining friendly local knowledge with professionalism into a single enjoyable package. Landings take place in a field and are typically smooth due in large part to the expert skills of the pilots, and putting a cherry on top of the experience is a lovely champagne breakfast at the end, with some tasty food and a drop of bubbly a great way to celebrate what will no doubt have been a memorable trip. Service with a smile and a proper level of passion, a comprehensive 4 hour experience and unmatched views of the Byron Bay hinterland short of being able to fly yourself make this one of the premier option for Byron sightseeing that’s also ideal for celebrating special occasions. Byron Bay owes a large amount of its history and development as a direct result of its origins as a surfing hotspot, with people having been drawn to the area for years to enjoy its quality breaks and put its surfing reputation to the test. The town has a highly active local surfing community, and at any given time of day a walk down to the shorefront will reveal a number of them busting some moves on the waves or waiting in the swell for the next decent set. It’s only fitting, then, that many of the first-timers to Byron are looking to take part in some surfing action themselves – however, if you don’t have the skills to give it a go, don’t fret: there’s plenty of chances for surfing lessons here, with local operation Let's Go Surfing being one of the best. This long-running and well established surf school combines a friendly and compassionate attitude to newbies to the world of surfing with an in-depth knowledge of local surf conditions to make for a solid all-round lesson. Let's Go Surfing use an effective training method that focuses on getting you up on your feet first and navigating the waves second – which is one of the first feelings of true achievement most budding surfers get. It’s a practical approach to introductory surfing that doesn’t get bogged down in the theory that’s foreign to most beginners in the first place. Small group numbers and a great student-to-teacher ration means that the amount of personal attention and instruction for each student is maximised, with a reputation for patience for any questions or uncertainties that may arise. "This long-running and well established surf school combines a friendly and compassionate attitude to newbies to the world of surfing with an in-depth knowledge of local surf conditions to make for a solid all-round lesson." The actual act of getting out on the water and obtaining your balance can be tricky at first, however repeating the process a few times and with a little guidance and positivity from your instructors, you’ll be sure to eventually get the hang of it. These surfing lessons last for 2 hours in small groups no larger than 6 surfers per instructor which is perfect for beginners to receive that personal attention to catch a wave. A 90 minute private lesson is an alternative option, and while they come at an extra cost the added personal attention can prove to be worth it if you’re having trouble mastering the basics. Let's Go Surfing provide all the necessary equipment such as the boards and wetsuits included in the cost of the surf lesson. All you need to bring is an adventurous spirit. If you’re looking to acquire some skills that may just give you the bug for surfing and end up turning into a lifetime passion, all amongst one of Australia’s most scenic areas, then a lesson with Let's Go Surfing in Byron Bay may just be right up your alley. A Byron Bay hang gliding flight takes the meaning of a “bird’s eye view” to the next level. Co-pilot a hang glider with your experienced instructor and see Cape Byron lighthouse and cliffs from the air. The flights are 30 minutes long with a full safety briefing and no experience is necessary. Learn the ropes and be up in the air in no time soaring over the Lennox Headland Reserve and Byron National Park under the guidance of your friendly pilot. The Byron headland is one of the most ideal locations in Australia to give this unique sport a go with beautiful scenery and marine life often spotted throughout your flight. "The Byron headland is one of the most ideal locations in Australia to give this unique sport a go with beautiful scenery and marine life often spotted throughout your flight." See pods of dolphins, rays, sharks, large schools of fish and even Humpback Whales from June to October. Byron Bay Airwaves Hang Gliding School have been taking people up on tandem joy flights for over 35 years now and love sharing this experience with first timers. The hang gliding experience includes a HGFA trainee membership covering you up to 4 months if you wish to book additional flights or lessons. Flights operate daily (weather permitting) from Tallow Ridge at Cape Byron Headland. Flyers can take part from age 10 and under 90 kg and you are welcome to bring your own camera to capture this incredible experience or purchase the inflight video. Hang gliding is an ideal way to discover the natural beauty of Byron Bay and one experience to add to the bucket list. If you’re an adrenaline junkie who’s been considering taking the plunge and jumping out of a perfectly good airplane, then there are few more stunning places in Australia in which to do so than Byron Bay. Byron’s scenery is pleasant enough when viewed from the ground or the water, but when seen from several thousand feet above the ground it’s truly beautiful – the blue-and-gold coastal aspect contrasts brilliantly with the vast array of greenery alongside it, although it may be a challenge to appreciate it all when you’re dropping from the sky at speeds of around 150km/h. Long-running staple Skydive Byron Bay provide those with stomachs of iron to embrace this ultimate rush that Byron Bay has to offer, for an experience most say can be truly life-changing. Starting off with a safety briefing and then boarding the light plane for the ascent into the skies, skydives here are conducted from the height of 14,000 feet. his is the highest allowable altitude for skydiving experiences in Australia – which typically provides around 60 seconds of free-fall before the chute opens and the more, shall we say, “scenic” portion of the adventure begins. It’s often difficult for people to express after their first jump which part of the dive is actually the best – the adrenaline rush of the free-fall or the awesome scenery from that high up. "If you’re an adrenaline junkie who’s been considering taking the plunge and jumping out of a perfectly good airplane, then there are few more stunning places in Australia in which to do so than Byron Bay." While skydiving is an experience that obviously comes with an initial fear factor, particularly for first-time jumpers, the staff here go a long way to helping to calm the nerves with their professional and friendly nature. They consistently ask if you’re OK, and give a lot of reassurance as they understand this can be a true “leap of faith” for many people taking part. Equipment-wise, everything is both top of the line, new, sturdy and well-maintained, and you’ll see the skydive staff pack the chutes before you go – something which can be strangely reassuring in itself! Skydiving Byron Bay’s drop zone is located relatively close to the centre of Byron Bay (around 10 minutes by car), making access from most accommodation in town a hassle-free breeze without the long travels to faraway drop zones that many other skydiving experiences near bigger cities entail. 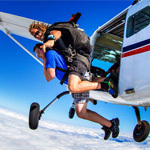 As an added bonus, transfers from both Brisbane and Gold Coast hotels are included in the cost of admission which is both convenient as well as a money and time saver, and to top things off this is also one of Australia’s most reasonably-priced skydives. Combine both of these factors with the physical beauty of the region and Byron Bay may turn out to be not such a laid-back and relaxed destination for you after all! Much of the area surrounding Byron Bay is a designated Marine Park, with its officially allocated area spanning a robust 22,000 hectares and features a number of standout sights to see, whether it’s the various reefs and coral communities dotted throughout, or the wide array of fish species, rays, eels and more which populate the waters. Boat tours are hardly the only way to get out and enjoy the beautiful and marine-life-rich waters of this area – activities such as snorkelling and diving are popular here, however one of the best ways to get a comprehensive overview of all its offerings is via kayak due to a combination of factors including accessibility, ease of control and speed. Go Sea Kayak Byron Bay provide tours into the heart of the Cape Byron Marine Park, with a welcoming, respectful and professional attitude while also being laid-back and friendly. While some may think that kayaking will be too great a physical challenge, this is not the case here; utilising special sea kayaks designed for stability, they’re people-powered vehicles that are easy to manoeuvre, with the main challenge coming with the initial getting out through the surf breaks and smooth sailing from then on out. On these kayaking trips, you’ll be guided on a route that is relatively calm – while it’s the open ocean, the kayaks are stable enough and the guides know both the area and the weather well enough that both first-timers and kids should feel comfortable participating. It’s certainly an interesting location for all ages to explore that doesn’t require a mature mind to appreciate; there’s a massive number of dolphins who inhabit this area, for starters, many of which will often have baby calves with them – an incredibly cute scene. "On these kayaking trips, you’ll be guided on a route that is relatively calm – while it’s the open ocean, the kayaks are stable enough and the guides know both the area well enough that both first-timers and kids should feel comfortable participating." Whales can also be spotted during their migratory season (often at a distance), while turtles coming to the surface for air are also a common sight. During the kayaking tours you’ll also receive plenty of explanation of the local landscape, geography and background on the influence of the region’s Aboriginal culture and traditions (one of the guides is an indigenous Australian). Several highlights of the Byron Bay area take on a whole new life when viewed from the water – you’ll see the lighthouse atop its cliffs, pass local surfing hotspots and paddle past the multi-million-dollar houses of the rich at the upper-tier Wategos Beach, providing a solid overall view of the region’s layout. The kayaking tours are comprehensive and last for 3 hours, which tends to hit just the right balance between seeing enough sights and returning before fatigue kicks in, plus it’s tour that offers a dose of exercise and fresh air rather than sitting on your backside within an air-conditioned coach. With double/triple kayaks designed for safety and sharing the workload, even the inexperienced can come along and enjoy the scenery here, and when weather conditions are at their best its a fun-filled way to explore Byron Bay from the water. Byron Bay’s extreme easterly location and abundance of coastline make it one of the best whale watching destinations in the country, and from the months of June through to November these incredible giants of the ocean can be found making their way through the waters along the course of Byron’s coastline. The humpbacks, as they make their way from Antarctica to the warmer climates of Tropical North QLD, are very active at this time, and their inquisitive nature makes them one of the more memorable creatures to encounter. While, if you’re looking to save money, Byron Bay’s headland offers decent opportunities to spot whales – both the Lighthouse lookout area and Captain Cook lookout offer a decent chance of snagging some views – this obviously can’t compare to getting up-close on the water, and it’s here that local operator Byron Bay Whale Watching come in. 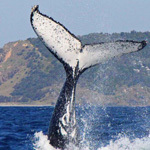 Plenty of pods of humpbacks can be seen throughout this period, and they offer tours that depart directly from Cape Byron making for a swifter and journey out to see the whales than other alternatives. These whale watching tours feature smaller vessels that are part-rubber and offer 360 degree whale viewing opportunities while still being built for stability. This smaller boat size also comes with the added benefit of tours being limited to smaller groups of only 12 people, making for a combination of uninhibited viewing and a more personalised atmosphere to boot. As humpbacks are amongst the most playful of the whale species, there’s plenty of chances here to get great photos of them splashing and breaching, and they’ll often approach the boat out of their own curious nature making for a truly “face to face” encounter. "This smaller boat size also comes with the added benefit of tours being limited to smaller groups of only 12 people, making for a combination of uninhibited viewing and a more personalised atmosphere to boot." Other wildlife in both the water and air helps to add more to the experience, as a variety of large sea birds can be seen circling the air before diving in pursuit of a meal, and a number of dolphins also call these waters home. The dolphins can often be seen playfully chasing the boat and playing in its wake or swimming alongside the vessel, while even the occasional marine turtle can be spotted in the waters below. The whales are still the undoubted stars of the show, however, and the whale boats also come equipped with specially-designed hydrophones that allow guests to hear the mesmerising “song” of the whales as they communicate with one another. Lastly, while whale numbers in the Byron Bay region are always generally quite high, for extra peace of mind in the (extremely rare) occasion that you don’t spot any whales during the journey, a whale sighting guarantee is offered that provides a free return trip. Combine all the aquatic life goodness with some great views of the coast and some of its icons from the water, and you’ve got a solid all-round sightseeing experience that makes it a must-do if you’re travelling to Byron Bay during whale season. Byron Bay is home to Australia’s most easterly point in coastal New South Wales surrounded by a marine sanctuary that is just waiting to be explored. Cape Byron Marine Park runs approximately 37km along the coastline from Brunswick River to Lennox Heads and is the perfect aquatic playground for snorkelers and divers. One site, just five minutes from Byron Bay via boat is Julian Rocks Marine Reserve within the Marine Park where both tropical marine life found on the Great Barrier Reef and the deep Southern Ocean converge. No experience is necessary for snorkelers to join aqua adventures with Byron Bay Dive Centre. All snorkel equipment plus wetsuits are included in the half day experience with snorkelers given at least 1 hour in the water to explore the marine reserve. Among some of the species of marine life that can be found in the beautiful crystal clear waters are sea turtles, an assortment of manta rays, soft and hard corals plus hundreds of species of fish. "One site, just five minutes from Byron Bay via boat is Julian Rocks Marine Reserve within the Marine Park where both tropical marine life found on the Great Barrier Reef and the deep Southern Ocean converge." Snorkelers should be able to swim confidently on this day trip and children as young as five can come along for a personal encounter with marine life. The real magic happens though when you dive into the depths of the ocean to see an even larger collection of marine life such as wobbegong sharks that prefer to lay low on the bottom of the ocean floor. Join a certified dive with all equipment provided alongside dive crew who love showing off this dive site that has an abundance of marine life no matter what time of year that you visit Byron Bay. Snorkel and dive trips run three times per day at 8am, 11am and 2pm from Byron Bay. Cape Byron Marine Park is a unique dive site to Australia with a combination of sub tropical habitats that supports threatened and protected species and hold a cultural significance to Aboriginal People. 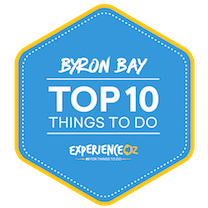 If you are intending to visit Byron Bay then a snorkel or dive trip should be on your top ten things to do here. If you want to explore Cape Byron and the wildlife rich waters of the Marine Park but don’t wish to go snorkelling, diving or hang gliding then a scenic cruise is a great option for all ages and abilities. 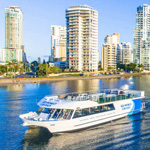 The four hour marine experience will take passengers on an adventure from the safety of the boat cruising along the New South Wales Northern coastline from Ballina Wharf. View the striking coastline including sandstone coloured cliffs, secluded beaches, the Julian Rocks Marine Reserve and of course the Cape Byron Lighthouse- Australia’s most easterly point. Not to be outdone by the natural beauty of the Byron Bay Marine Park that stretches from Byron Bay to Lennox Head are the hundreds of marine species that can be found here all year round. "Not to be outdone by the natural beauty of the Byron Bay Marine Park that stretches from Byron Bay to Lennox Head are the hundreds of marine species that can be found here all year round." Of course you can see all these things from the mainland, however, via a scenic cruise you will be able to appreciate the cliffs, lighthouse and marine life from a different perspective. Cruises will also take you far closer to marine life including pods of dolphins, sea turtles and Humpback Whales seen in the region from June to October. If you are staying in Byron Bay or Lennox Head then you can take advantage of the free transfers to deliver you to Ballina Wharf to join this scenic cruise.